The new Research & Collections Resource Facility (RCRF) replaces the Book and Record Depository (BARD) in housing the Depository Library. The Depository Library consists of more than 3.5 million items from the University of Alberta Libraries that are less frequently accessed. The RCRF also houses the University of Alberta Archives and will be home to a new digitization centre. The facility is located on South Campus, just south of the Fort Edmonton/South Campus LRT station and Saville Community Sports Centre. 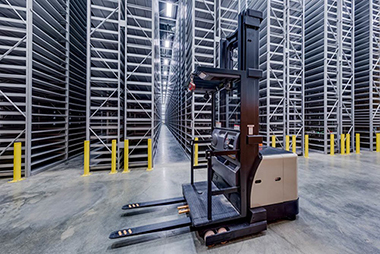 The RCRF contains environmentally controlled storage spaces to maintain the highest standards for preservation of the Archives and Libraries’ collections. The facility includes a reading room and a multipurpose room for the use of students, faculty, and visiting researchers. All visitors must make an appointment to use the Reading Room or Multipurpose Room. The “Place Hold” button on an item record allows you to request an item that will be delivered for pickup at any UofA or NEOS library. The RCRF is not a pickup location. Service Standard: Available for pickup within one to two work days (Monday through Friday) at your selected pickup location. Some materials are not directly requestable via the catalogue. Please use the BARD (RCRF) Request Form to request all other material from the Depository Library. Service Standard: Available for pickup within two to three work days (Monday through Friday) at your selected pickup location. Registered distance students/faculty can request items from the University of Alberta, including the RCRF, and NEOS libraries directly via the catalogue (using via Search the Library) “Place hold” option. Select University of Alberta Distance Service as your pickup location and have the items mailed to their work or home address. To register or for more details about this service please visit our Distance Services page.